These awards happened while I was away on holidays so I missed the conversations around the large number of Irish winners in the Great Taste Awards 2011. They are very well respected within the food sector and a win here is an indicated of a seriously good food product that is ranked by its peers. 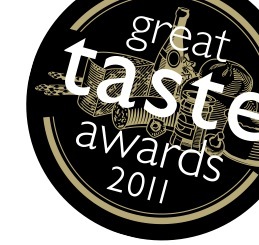 2 star – Fairtrade Master Blend , Bewley’s Ltd.
2 star – SQ Luxury Muesli , Superquinn Ltd.
1 star – Pure Rooibos Tea – Produced By Keith Spicer Ltd , Bewley’s Ltd.
1 star – Pure Camomile – Produced By Keith Spicer Ltd , Bewley’s Ltd.
1 star – SQ Kalamata Whole Olives in Brine , Superquinn Ltd.
1 star – SQ Queen Whole Olives in Brine , Superquinn Ltd.
1 star – Superquin Sillan or Fresh Corn Fed Chicken with caramelised onion stuffing , Carton Bros Ltd.
1 star – Wexford extra mature , Wexford Creamery Ltd. There are so many brands there I have not come across – what a strong endorsement of the quality of Irish food production. And look at the number of them who are in the artisan or local food producers world. ← Take a shedful of oats and a heap of product innovation..
cool there keith with the web links! i only managed to get their phone numbers up on mine on tues http://irishfoodguide.blogspot.com/ – the http://www.greattasteawards.co.uk/ site didn’t give an easy option to collect the irish results – had to find, copy and paste!